Here we go again on the lakes searching for those elusive large perch. 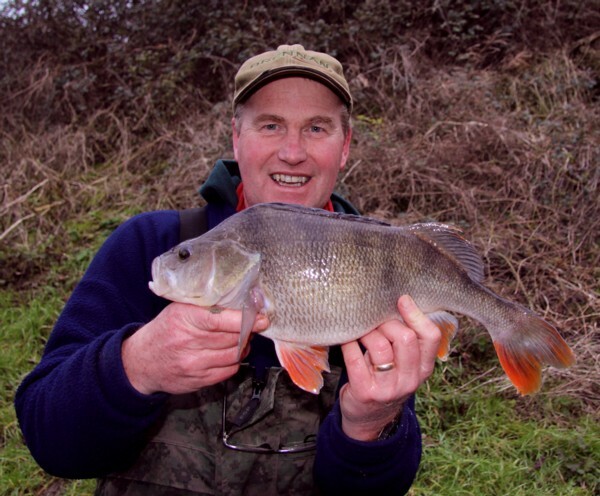 Many people are complaining about the lack of perch showing on the lakes I fish. However up and down the country you can see some huge specimens being caught and a fair number to the drop shot method. This time my mate John wanted to join me for a session on the lake. I was down there at 7.15am just as the light starting to turn into day. I’m normally the first down on the lake and have first choice of the swims. The best swim from previous sessions I kept free so that John when he arrived could settle in there. I fished the other end. John turned up at 8am and he set himself up in the swim but didn’t fancy the long distance involved when using a float. So he moved to the next swim and to be social I moved into the swim I had saved him. Then the owner came around for a chat and guess what he said the perch had been showing where I had moved from, so after another move I settled into the original swim. John was fishing opposite me and was soon landing a good few roach. Nothing much happened to me until about 10am when I landed a nice common carp of about 5lbs. 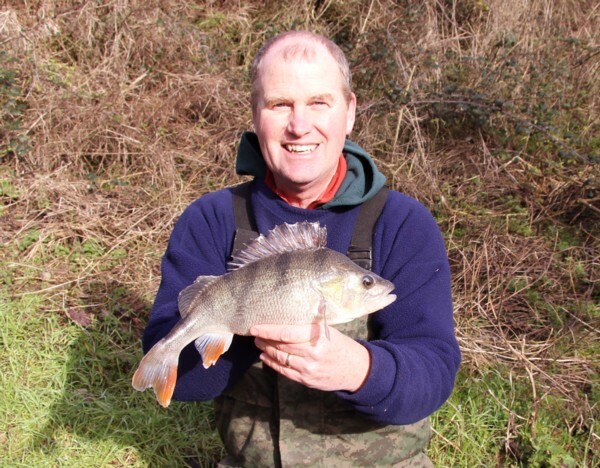 Then Malcolm a fellow Tench Fisher came along at 11.30 and sure enough he bought me good luck as I had a bite from a nice 1lb 14oz perch. Then it was pretty much none stop action. John moved around a fair bit as the wind increased in speed and it was cold too. He continued to catch a few more roach and some F1’s. I was catching steadily during the afternoon. It was the humble prawn doing the business with maggots being sprayed over the top on a very regular basis. At 12.45 Malcolm and John were in my swim when the RHS rod indicated a perch take, then the LHS one was away and I had a double hookup. 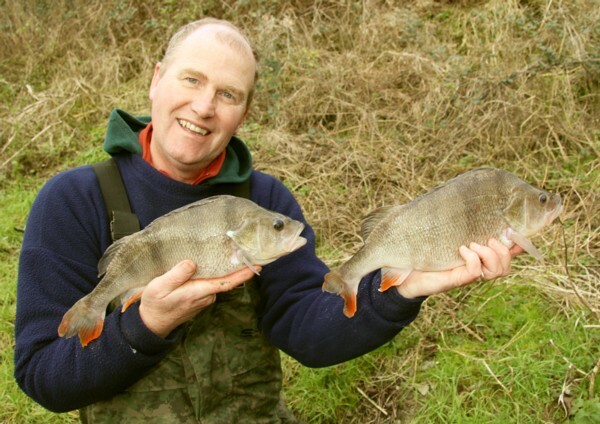 Malcolm gave me a hand in landing these two and they looked impressive in the net. Not huge but at 2lbs and 1lb 12oz it had to be a great trophy shot taken by John. They still kept coming and spraying maggots certainly helped, I got through 4 pints today! 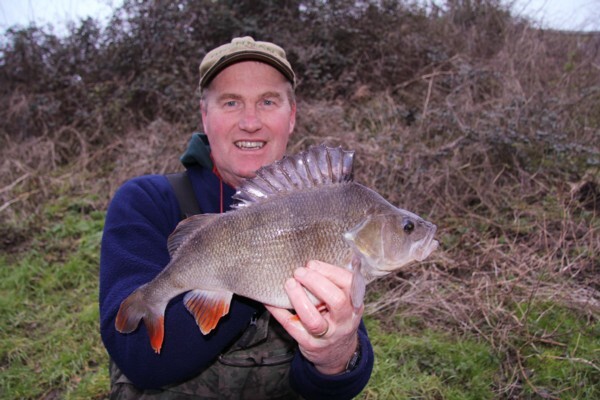 The largest perch was stunner at 2lbs 13oz and Malcolm helped me with the photo’s as my camera man John, decided to call it a day before the rain arrived. Those that know me and people I guide will tell you that I always keep a good record of fish weights and time caught on my notes page on my phone. That way it always helps in identifying feeding times. Like on this venue on the previous visit I didn’t have a bite until near midday……so perhaps I needn’t get there at the crack of dawn and also save on maggots. Here is my list of fish caught today downloaded from my phone. This entry was posted on Thursday, January 23rd, 2014 at 10:47 pm	and is filed under Uncategorized. You can follow any responses to this entry through the RSS 2.0 feed. Both comments and pings are currently closed.